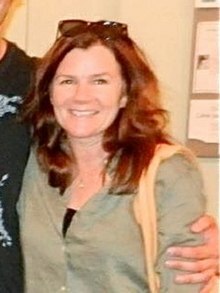 Mary Megan Winningham (/mɛər/; born May 16, 1959) is an American actress and singer-songwriter. An eight-time Emmy Award nominee, she won Outstanding Supporting Actress in a Miniseries or Movie for Amber Waves in 1980 and George Wallace in 1998. She was also nominated for the Academy Award for Best Supporting Actress for the 1995 film Georgia. Winningham's other film and TV roles include St. Elmo's Fire (1985), Miracle Mile (1988), Turner & Hooch (1989), The War (1994), Dandelion (2004), Swing Vote (2008), Brothers (2009), Mildred Pierce (2011), Hatfields & McCoys (2012) and four seasons of American Horror Story: Coven (2013), Freak Show (2014), Hotel (2015-16) and Cult (2017). She made her New York stage debut in the 2007 Off-Broadway musical 10 Million Miles, for which she received a Drama Desk Award nomination. and her Broadway debut in the 2013 revival of Picnic. In 2014, she was nominated for the Tony Award for Best Featured Actress in a Play for the original Broadway production of Casa Valentina. Winningham was born in Phoenix, Arizona, and raised in Northridge, California. She is the daughter of Marilyn Jean (née Maloney) and Sam Neal Winningham. She has three brothers and one sister. Her father was the chairman of the Department of Physical Education at California State University, Northridge (CSUN) and her mother was an English teacher and college counselor at Monroe High School. She credits her first interest in acting to seeing an interview with Kym Karath (who played Gretl in The Sound of Music) on Art Linkletter's television show House Party when she was five or six years old. Winningham attended Andasol Ave. Elementary School, where her favorite activities included drama and playing the guitar and drums. She took the extended drama option at Patrick Henry Junior High School and continued to study over her summer vacations at CSUN's Teenage Drama Workshop. It was at this time that she adopted the nickname "Mare". Her mother arranged for her to go to Chatsworth High School. In grade 12, Winningham starred in a production of The Sound of Music, playing the part of Maria, opposite classmate Kevin Spacey as Captain Von Trapp. She graduated co-valedictorian (with Spacey) of her high school class in 1977. Winningham began her career as a singer-songwriter. In 1976 and 1977, she got her break singing The Beatles song "Here, There and Everywhere" on The Gong Show. Though Winningham received no record contracts as result of the appearance, she was signed to an acting contract by Hollywood agent Meyer Mishkin, and received her Screen Actor's Guild card for doing three lines in an episode of James at 15. That year she was offered a role on Young Pioneers and Young Pioneers Christmas, pilots for the short-lived 1978 drama The Young Pioneers. Though the series ended with just three episodes being broadcast, a number of television projects followed, including parts on Police Woman in 1978 and Starsky and Hutch in 1979. Later that same year, she played the role of teenage outcast Jenny Flowers in the made-for-TV film The Death of Ocean View Park. In 1980, Winningham starred in Off the Minnesota Strip playing a young prostitute. She then won an Emmy Award for Best Supporting Actress In A Miniseries Or A Movie for her role in the critically acclaimed Amber Waves, a television film about a rough farmer (Dennis Weaver) who finds he is dying of cancer. In that year, she also broke into feature films with One Trick Pony, starring Paul Simon. In 1983, Winningham was nominated for a Canadian Genie Award for her work in the futuristic 1981 drama Threshold, and appeared in the 1983 epic miniseries The Thorn Birds, in which she played Justine O'Neill. In 1984, she starred as Helen Keller in Helen Keller: The Miracle Continues. Winningham achieved greater fame co-starring in St. Elmo's Fire (1985), alongside the other original "brat pack" alumni. Despite the film's success, she failed to cash in on her teen idol status, and returned to television in the Hallmark Hall of Fame movie, Love Is Never Silent, for which she received an Emmy nomination. Another well-known and well-received performance was as a homeless young mother in the television movie God Bless the Child. Winningham finished the 1980s with two Hollywood films: the nuclear disaster drama, Miracle Mile (1988), for which she received an Independent Spirit Award nomination in 1989, and the Tom Hanks vehicle Turner & Hooch in 1989. In 1988, Winningham also starred in the Los Angeles stage production of Hurlyburly with Sean Penn and Danny Aiello. She made acclaimed appearances on the series ER and Law & Order: Special Victims Unit, as well as appearances in the 2001 television project Sally Hemmings opposite Sam Neill and the short-lived David E. Kelley series The Brotherhood of Poland, New Hampshire. Also in 2001, she appeared in the made-for-TV movie Snap Decision with Felicity Huffman. She also appeared in the independent film Dandelion, which was a staple of film festivals worldwide between 2003 and 2004 and had a limited American release in October 2005. In 2006, she landed the role of Susan Grey on the ABC drama Grey's Anatomy where she played the stepmother of one of the main characters, Dr. Meredith Grey. Her character was killed off in May 2007. In 2006, Winningham voiced the audio version of Stephen King's Lisey's Story. In 2007, she voiced Alice Hoffman's Skylight Confessions. In 2010, Winningham starred in an episode of Cold Case as main character Lilly Rush's stepmother, Celeste Cooper. In 2011 she appeared in the fourth episode of Torchwood: Miracle Day as character Ellis Hartley Monroe. She also starred in miniseries Mildred Pierce and Hatfields & McCoys and garnered another two Emmy nominations. In 2012, she appeared Off-Broadway as Beth, the mother in an intellectual, though dysfunctional, British family, in the award-winning comic-drama Tribes by Nina Raine. Winningham has alternated her film career with a music career, and has used some of her films as a way to showcase her singing. She can be heard singing a few bars of "Me and Bobby McGee" in One Trick Pony. In 1981, she played a teenage runaway with an aspiration to become a singer in the TV film Freedom, and sang six songs in the film, all written by Janis Ian. She appeared as a club singer in the film Teresa's Tattoo, and sang three songs in the film Georgia. Winningham has recorded four albums: What Might Be (1992) on the Bay Cities label, Lonesomers (1998) produced by Carla Olson on the Razor and Tie label, and Refuge Rock Sublime (2007) on the Craig & Co. label. Lonesomers is a folksy album dealing with relationship issues. The country/bluegrass/Jewish/folk songs on Refuge Rock Sublime deal mostly with her recent conversion to Judaism, and include the tracks, "What Would David Do," "A Convert Jig" and the Israeli national anthem "Hatikva". Winningham released her fourth album What's Left Behind independently on digital outlets in March 2014. Winningham was raised a Roman Catholic. In November 2001, on a friend's recommendation, she took a class given by Rabbi Neal Weinberg at the University of Judaism (now the American Jewish University) in Los Angeles. On March 3, 2003, she converted to Judaism. She has been married three times: A Martinez (1981–81), William Mapel (1981–96) and Jason Trucco (2008–12). ^ a b c d "Mare Winningham". Television Academy. ^ a b c d e f "Mare Winningham". Yahoo Movies. Archived from the original on 2013-12-04. ^ "Edward-J-Maloney-Papillion - User Trees - Genealogy.com". ^ Kaufman, Joanne (9 January 2013). "They Call Her 'Mama'". Wall Street Journal. Retrieved 29 November 2016. ^ "A Conversation with Kevin Spacey". cinequest.org. ^ Naomi Pfefferman (17 September 2004). "Actress-singer Mare Winningham an unlikely Jewish soul". Jewish News Weekly. Retrieved 2008-04-06. Wikimedia Commons has media related to Mare Winningham.